Coat Racks with natural Beach Stones. Stone towel hooks. Rock coat hooks. Wall hooks – coat racks with Smooth Beach Stones. Wall mounted solid wood coat rack with natural Baltic Beach Stones. Beach stone towel hangers are the best choice for those who are looking for a unique and handmade housewarming idea. Hand picked stones are from the shores of Baltic Sea. Each smoothed rock has unique structure and colors which suite any home. We use only stainless steel and copper parts to avoid rusting. Back plates are made from hardwood such as oak, maple or ash. To strive protect trees we collect only branch wood. Lifetime manufacturer's guarantee. Ideal present for you, your loved ones or friends! Number Of Items: 3. It measures approx: 5.9" high by 3.3" wide (15 cm high by 8.5 cm wide). It has wall fixings to the rear (screws included). 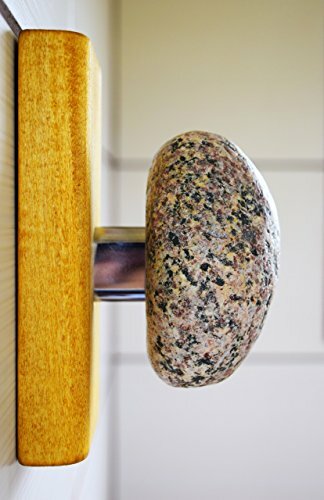 Our Beach Stone hangers can be used in hotels, restaurants, cafes, offices, bathrooms, kitchens, entryways, bedrooms etc. This handmade item is tasteful and versatile gift that provide a natural accent to any decor. We can make this coat rack in other sizes and back plate coloring, please contact us for a quote.